Author/Artist: Mark W. Muesse. Type: ISBN. All 4 DVD's are in mint condition, as well as the books. Complete course. Astronomy "Our Night Sky" Great Courses-Series DVDs & Guidebook 2010 Sealed New. Condition is Brand New. Shipped with USPS Media Mail. Both DVDs are pre owned. Have been used but overall good shape. Free shipping included. 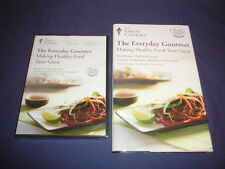 Great Courses The Everyday Gourmet Making Healthy Food Taste Great DVD - NEW. Condition is Brand New. Shipped with USPS First Class Package. Trending at $12.65eBay determines this price through a machine learned model of the product's sale prices within the last 90 days. Astronomy "Our Night Sky" Great Courses-Series DVD's & Guidebook 2010. Condition is Brand New. Shipped with USPS Priority Mail. The Spiritual Brain: Science & Religious Experience DVDs/Guidebook Great Courses. Condition is Brand New. Shipped with USPS. Together, they make an informative and engaging team from which to learn everything you need to master the secrets of healthy cooking—and to improve your health through the dishes you make and eat without having to compromise on taste. Includes DVDs and guide in each case. See pictures to verify contents. New and sealed with a small open area in the back. See pictures for details. 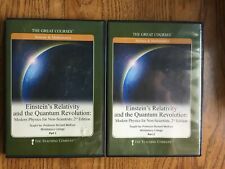 The complete course of 24 lectures presented on 4 DVDs, and the guidebook. 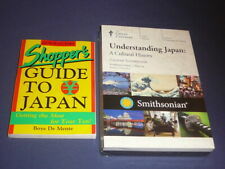 Understanding Japan : A Cultural History. ( course # 8332). my 347-page softcover book on an important facet of Japanese culture. New and sealed. See pictures for details. The Great Courses. The Spiritual Brain Science and Religious Experience. DVD Set, Case and cover art in very good condition, ready to be enjoyed. Adding Flavor with Healthy Oils. Making Healthy Cooking a Lifestyle. Nutritious and Satisfying Whole Grains. This is a hardcover book with 72 pages. In like new condition. Pages are clean. You’ll also learn. 24 lectures | 30 minutes per lecture. The Spiritual Brain : Science & Religious Experience. In fact, archaeological and historical records show that even the earliest humans were aware of a spiritual realm and developed religious practices as a result. SO MUCH EASIER THAN LOOKING FOR ALL OF THEM! THE GREAT COURSES ARE A VERY EXPENSIVE SET OF BOOKS & AUDIO. SANDY & SON, DAVE. Any minor defects not visible to the naked eye or through touch may not be noted. IN GREAT CONDITION! PLAYED ONLY ONCE! NOT A BOOTLEG! DVDs, guidebook and case are in great condition. AMAZING DVD set! Usually quicker. Make sure it is exactly what you are wanting. LOW PRICE! Why buy through us?. Have an issue?. Parts 1 and 2 includes four DVDs and the Course Guidebook. Up for sale is a10 Disc Set of The Great World Religions Buddhism Christianity Hinduism Judaism Islam inEXCELLENT condition.Most of these look like they were never used. This is a 10 DVD set. 4 DVD and Course Guidebook. (DVD, 2013). I am not an expert on grading, nor do I claim to be. This item is the exact item you will be receiving (See Pictures). Great Thinkers, Great Theorems. Professor William Dunham. 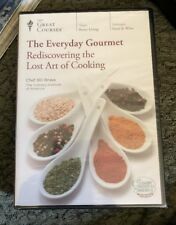 This is a set of 24 thirty minute lectures on 4 DVDs. What you will receive is what is shown in the photos. If it is not in the photos, or described here, you don't receive it. Thinking like an Economist 6 DVD set with Course Guidebook. Thinking like an Economist 2 DVD set with Course Guidebook. Regardless of what secrets or tricks he’s showing you, Chef Durfee always makes baking accessible. But baking desserts from scratch, even desserts that you’d expect to find only in five-star restaurants, is a lot less difficult than you might think. Everything in very good condition. Disc(s) clean and unscratched. What makes French wines stand out from their international counterparts?. How does the varied landscape of France shape and influence what’s in your wine glass?. Why do French wines command such respect from culinary experts and casual drinkers?. The DVD set of 6 discs with the course guidebook, sealed and. Great Courses Nutrition Made Clear Roberta Anding. Pre-owned in very good condition. Three parts/ 6 DVD's/ 36 lectures 30 minutes long. Booklets with each part. (One booklet has a stain on cover, see photo) DVD's in excellent condition. Workbook included. This is a new set that includes not only the guide and DVD set, but it also includes the transcript book. It is, however, a new set of discs and manual. Discs have been tested and play great! The item pictured is the item you will receive. Net proceeds from the sale of these goods and financial donations from the community make it possible for us to operate our free job training programs.